Shortly after our filling meal at Tonkichi (Causeway Bay), we decided to push the boundaries of our stomachs by going for dessert around the corner at Rice Paper, a Vietnamese restaurant chain (which apparently serves the food of “Today’s Vietnam”). My sister, who had just visited Hong Kong a week before us had personally recommended it. We got a seat immediately by the window with a great view of the bay. The interior was very clean, very classy, completely unlike the cheap and dirty Vietnamese restaurants in Sydney that I’m used to (and love). Everyone else around us was having rice paper rolls and hot noodle soup, but I was still so stuffed from the Japanese that it wasn’t enticing at all. 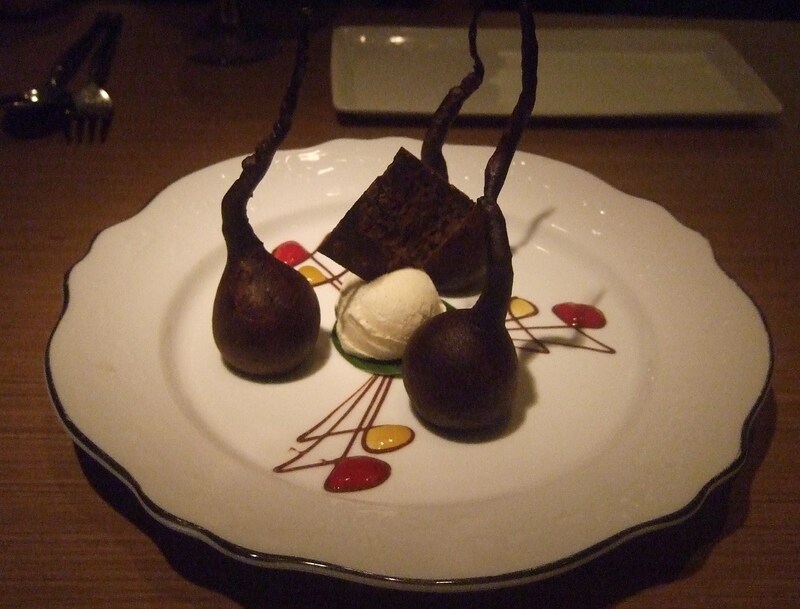 All the desserts on the menu looked unbelievable, but we ended up going with the signature dish called “French Kiss”. I’ll let the photo speak for itself but it was genuinely sensational. The shortbread sandwich, the nougat, the almond and the raspberry sorbet combined to provide a sweet and sour flavour with a crunchy twist. The chocolate dessert (can’t remember the name but it was recommended by the waiter) was also quite good. Very pretty too. I can’t rate the restaurant as a whole as I didn’t taste any of the main dishes, but the dessert certainly was unexpectedly exquisite, especially for a Vietnamese restaurant!